When the sun sets along the Grand Strand and that last putt drops, it’s time to shift strategies from mapping course approaches and conquering bunker lies to setting your sights on the 19th hole and beyond. 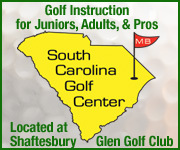 The seemingly endless variety of restaurants, shops, attractions and nightlife in Myrtle Beach provide a welcome break from the day’s competition and an opportunity to spend quality time with friends and family – virtually guaranteeing total, unwavering support for future beach golf vacations. 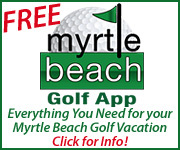 Because we know that navigating the sheer number of choices of things to do in Myrtle Beach alone, as well as North Myrtle Beach attractions and those of our sister beaches can seem daunting – even for return visitors – we’ve assembled an easy reference Myrtle Beach vacation guide for you below. 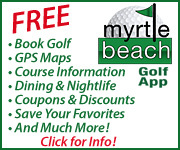 Map out what to do and where to eat in Myrtle Beach, before you even pack your clubs! Overlooking a tranquil salt marsh in Murrells Inlet and features fresh local seafood, aged beef cooked over mesquite, and pizzas cooked in a wood-fired brick oven. 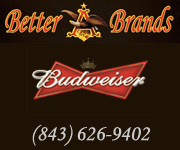 Enjoy a nautical all you can eat seafood buffet with a complete seafood assortment as well as traditional fare. Enjoy a large selection of fresh seafood, aged beef, exotic meats, fresh sushi, and mouth-watering appetizers with waterfront views.